Thanks goodness!! I love that word is starting to finally get out about bone broth. And with good reason (see benefits here). It’s so good for us that one doctor that I work with, Dr. Taz, wrote a whole book that includes a gut healing diet includes consuming bone broth on a regular basis. Another doctor at the office, Dr. Zach, gives some of his patients a recipe for bone broth (I love that!). It’s THAT good for us! And not only is it a super health food that can heal your gut, but it also can help joints, improve digestion, strengthen your immune system, and did I mention that it combats wrinkles, cellulite and weight gain? Bone broth anyone?! It’s funny, not too long ago people would ask me with a slight smirk, “what is bone broth and why in the world would you drink it?” You would think I’m drinking blood or something. Anyway, fortunately because many are now learning the benefits, the questions have gone from “what” or “why” simply to “how” or even “where”? So I wanted to break it down for you all, step by step. I am going to show you how to make chicken bone broth (instead of cow bone broth) since, we eat chicken for dinner about once a week, and it is a lot easier to find organic chicken or chicken bones. 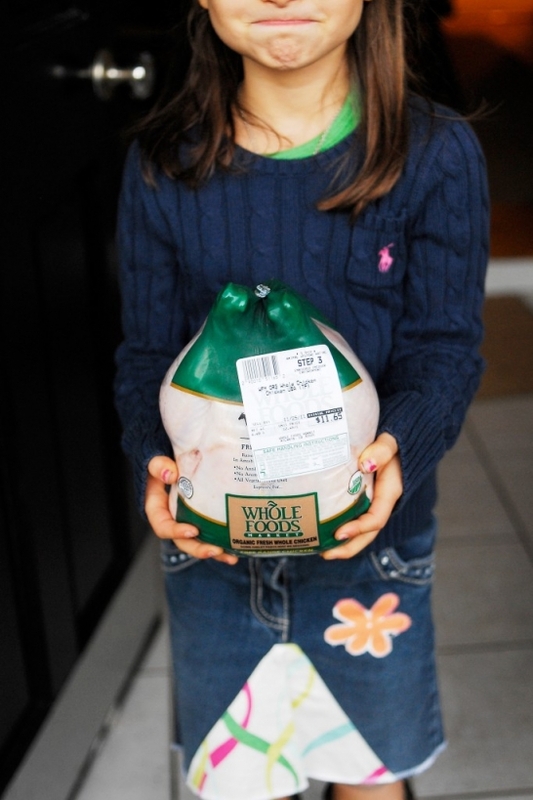 We typically use a whole chicken, but you can cook with parts of the chicken with decent size bones and joints like legs or thighs. 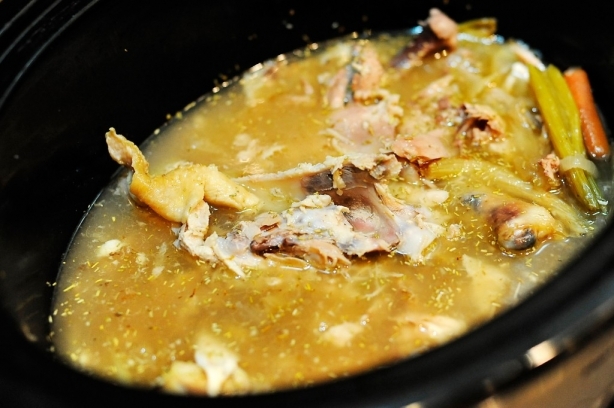 The simplest way I have found to make bone broth is by using a slow cooker. Start by placing your whole chicken in the cooker and add any veggies or spices you like (see my recipe below for what we use). It is not necessary to add liquids at this point as you’ll get them naturally from cooking. We love to dip our chicken pieces into the juices once it’s cooked! Cook your chicken on high for about 4 hours or low for about 6 hours. 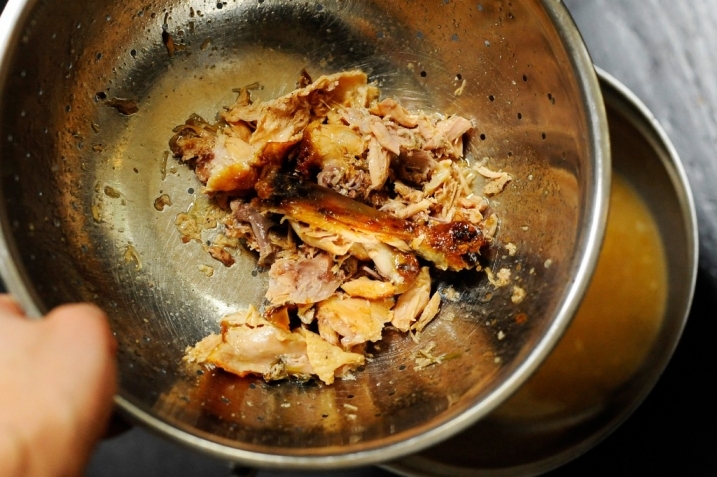 If you cook it on high, the chicken will fall off the bone and be more like shredded chicken. If you cook on low, you’ll have full pieces to pull, so decide what you prefer before choosing what temperature to cook your bird. Once it’s done, tear apart the meat and set aside. Next break the bones apart (so you can get the nutrients from the bones and joints) and add about 1 tbsp of apple cider vinegar and enough extra water to just barely cover the bones. Cover and cook on low for 8-12 hours. The longer you cook it, the better it is for you and the stronger the flavor. Then, the easiest way to transfer the broth is to use a large bowl and a strainer. The best strainer to use is mesh but I didn’t have mine at the time of the picture. Place the colander over the bowl and then pour the chicken broth and leftover bones/meat. Dispose of the bones and then you have your bone broth. 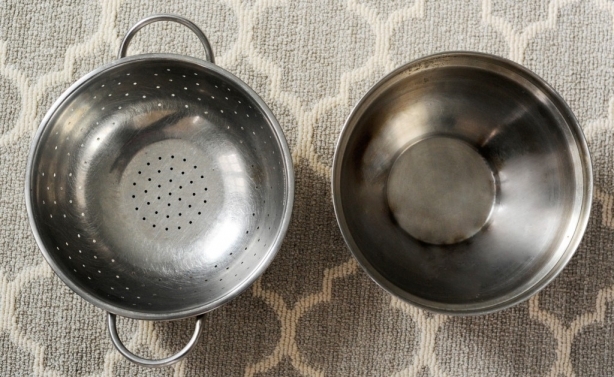 If you used a non-mesh colander like I did, then you may still want to strain it before you drink or cook with it. I used a small strainer before placing the broth in big jars. This was a slight pain, hence why I got this strainer on Amazon recently. Next, you can either save it in big glass jars and put it in the refrigerator for about a week or you can freeze them for about 6 months. 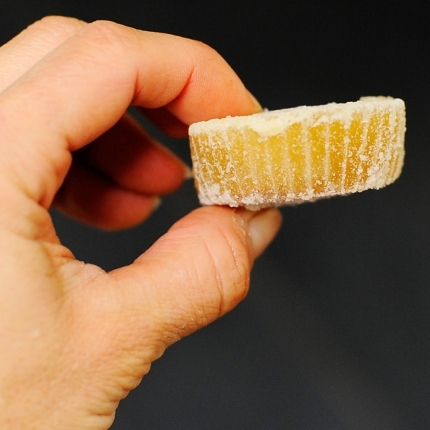 If you are going to freeze them, be sure you don’t fill it to the top or the glass might break. 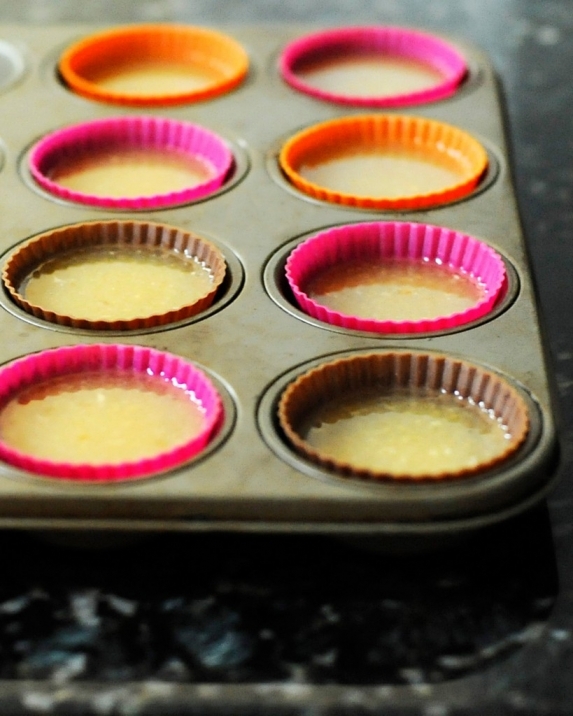 When freezing the broth, I like to use silicone muffin cup holders. They are great for for individual size portions. So, to answer some of the “where” questions. 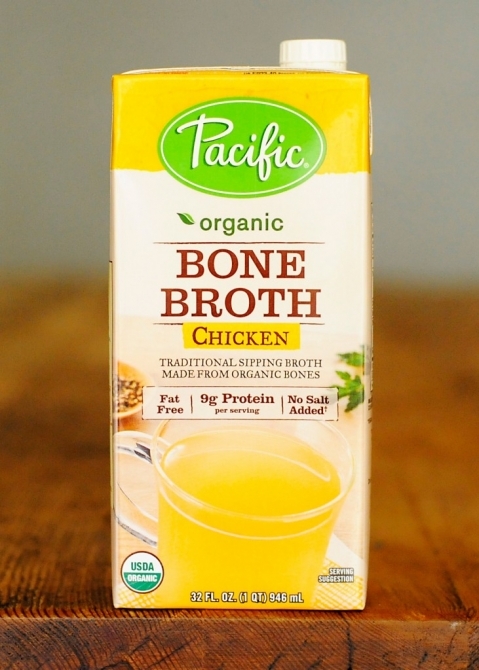 So if you would rather buy your bone broth, Pacific has a good one that you can get at Whole Foods, when you can find it. Vitacost.com, one of my favorite online food retailers, has it too. It’s not as nutritious as homemade, but it’s not too bad either. It’s actually made with organic chicken, spices and apple cider vinegar. And it contains 9 grams of proteins per serving which means it was cooked low and slow enough to get protein from the bones. And another option, if you want to buy it, but you want it there are a couple of places that I’ve heard about recently. 3. Souper Jenny’s is going to start carrying it so call ahead. 4. MetroFresh in midtown (and likely many other locations) offers it most days as well. I hope this gives you some way to make, get or buy some good bone broth and make it a new habit for you for the new year! 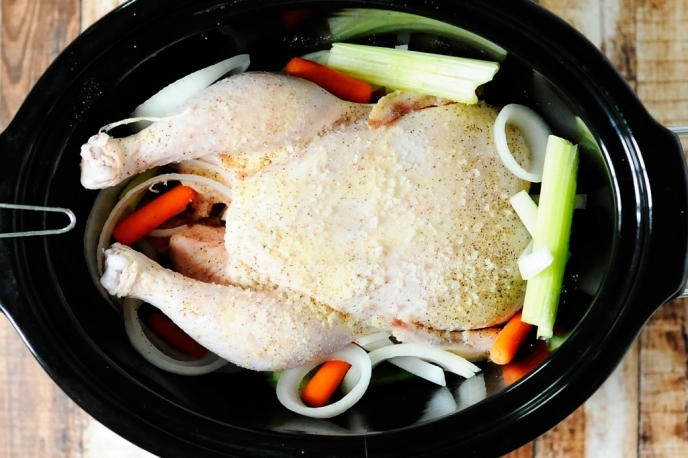 Cook whole chicken in slow cooker on high for about 4 hours or low for about 6 hours. Take all of the meat off of the chicken. Crush the bones down some. Add enough water to just about cover the bones. Cover and cook on low for 8-12 hours.